The Swiss Museum of Games in a small chateau right on the banks of Lake Geneva between Vevey and Montreux is a great day trip destination from Genève, Lausanne, or Evian. The Swiss Museum of Games (Musée Suisse du Jeu) is in a lovely small chateau directly on the northern shore of Lake Geneva in the small community La Tour-de-Peilz between Vevey and Montreux. The museum focuses on board games throughout history with displays from many regions of the world. The castle itself is worth exploring too with the views of Lac Léman and the Alps particularly splendid from the top of the freestanding tower. A day-trip from Geneva, Lausanne, or Evian to the Swiss Museum of Games combines very well with a stroll on the lakeside promenade to Vevey, pleasure cruises on Lake Geneva, and further sightseeing in nearby Montreux. 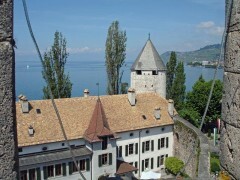 The Swiss Museum of Games opened in 1987 in an historic castle in La Tour-de-Peilz near Vevey. The castle’s origins go back to a thirteenth-century fort used by the rulers of Savoy in controlling strategic trade routes. The fort was largely destroyed during the early sixteenth century and much of the present chateau dates from the late eighteenth century when the ruins fell in private hands. The displays in the museum range from simply play-in-the-sand games originating from Africa to sophisticated video games and gambling equipment. The largest part of the museum is dedicated to board games of which many are more art than toys. The historic displays in the Swiss Museum of Games are clearly aimed at adults – toys behind glass simply do not sit well with the young ones. However, for smaller children there is much to enjoy at the museum and in the immediate vicinity too. Although most displays are not for touch, a few games are set aside for children to play with and a special teaching discover box is available at reception to make the museum more interesting for smaller children too. The museum itself is in a castle with numerous hooks and crannies and the not altogether logical layout is fun to explore too. Visitors may scale the tower by a steep wooden staircase, through narrow entrances, and finally up a steel spiral staircase to the top of the tower and spectacular views of Vevey, Lake Geneva, as well as the French and Swiss Alps. The museum gardens have a small play area and numerous further playgrounds with slides and climbing frames are scattered in the parks adjacent to the tree-lined lakeside promenade leading to Vevey. 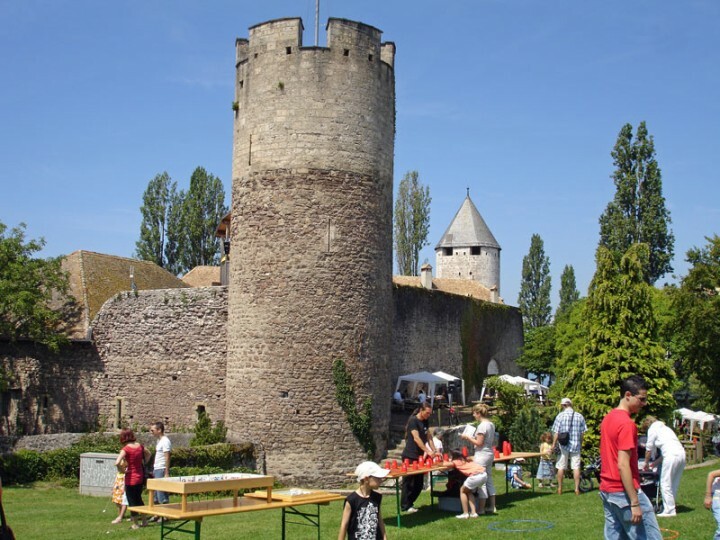 The best day to visit the museum is the Le Chateau des Jeux – C’Est Votre Tour festival, usually held mid-September. On this Saturday, the museum is open to all and in the gardens many games are available suitable for all ages. Instructors are at hand to explain the finer intricacies of the various games. Admission to the museum and participating in games are gratis too. The Swiss Museum of Games is located in Au Château, CH-1814 La Tour-de-Peilz, Tel 021/ 977-2300, on the lakefront of Lake Geneva and within easy strolling distance from Vevey. The museum is open Tuesday to Sunday from 11 am to 5:30 pm. Admission is CHF9 for adults and CHF3 for children 6 to 16. The Swiss Museum Pass is valid. Picnicking is allowed in the gardens of the romantic chateau as well as in the parks along the lakeside promenade. A reasonably priced restaurant – Domino – is in the castle courtyard while numerous restaurants and kiosks line the promenade towards Vevey. The Swiss Museum of Games is a great day-trip destination from nearby Lake Geneva region cities including Genève, Lausanne, Evian, and Montreux. 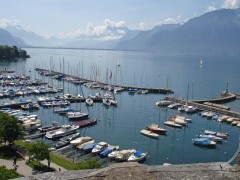 A visit to the museum combines well with cruising on Lake Geneva and visiting historic Chateau de Chillon near Montreux.